A: Has this ever happened to you? It’s the week before Thanksgiving, the turkey’s in the freezer and the menu is finalized, when a cousin lets slip that she’ll be bringing a new vegetarian boyfriend to the meal or a sibling reveals that they’ve gone gluten-free. If so, you know how stressful it can be. Food plays a central role in family celebrations and holidays, especially at Thanksgiving. Everyone wants to accommodate people with special dietary needs (maybe you have some yourself! ), while at the same time not making them feel left out of the celebration. Add to that the difficulty of adding another entree to an already packed cooking schedule and you’ve got a recipe for panic! Don’t worry: EatingWell has you covered! We’ve created a number of easy-to-make, fast-cooking main dishes that keep all of Thanksgiving’s cheer while meeting the needs of a variety of special diets. 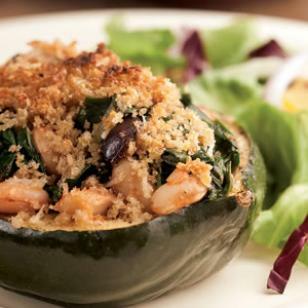 Check out our easy Vegetarian Thanksgiving Main Dishes here. Download a FREE Vegetarian Holiday Dinner Menu & Shopping List! Browse our Gluten-Free Thanksgiving Dishes here. Download a FREE Gluten-Free Thanksgiving Menu & Shopping List! Discover our Diabetes-Friendly Thanksgiving Recipes and Holiday Tips for Diabetic Eating here.